shine brite zamorano: scraper mashup. Today was my last day of classes for the next couple of weeks so the art team can prepare thousands of works for our end of the year Celebration of Art. It was an extra day with my 2nd graders and the last time I would see them for the year. 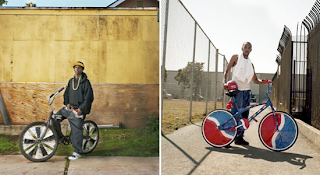 Looking for project ideas I came across the work of photographer Matthew Reamer. One series of photos he did focused on the scraper bikes that are being made in Oakland by kids and teenagers. Babye Champ (aka Tyrone Stevenson Jr.) is the founder of this movement and team. I loved the reuse of materials and the patterns and colors that these guys are playing with. The other thing that is cool about these bikes is that the club/team is used as an incentive for kids in dangerous communities to stay out of trouble. 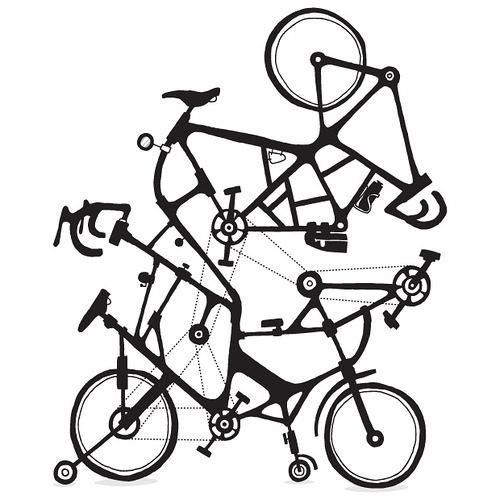 Last year I did a project based on a bike illustration that Alex Eben Meyer did with my 4th graders. When I discovered these scraper bikes I thought it would be interesting if the two worlds met. After showing the students images of both the west and east coast bikes, we got started creating our mashups of them. In this case, east and west coast got together like peaches and cream. We started creating our bike drawings together. We used geometric shapes for the frame and wheels and then I modeled different types of seats and handlebars the kids could make. Once the first bike was drawn on their paper then they needed to add more parts to it. I told them they needed to add at least 3 extra wheels. Any other additions were up to them. I offered suggestions like fenders, lights, extra seats, and so on. The kids definitely got into it. As the day went on the classes (and myself) got more adventurous with what we added on as well. 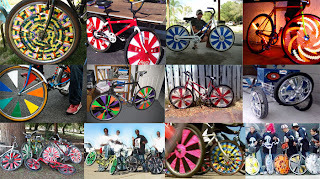 When the pencil drawing was complete the students had about 25 minutes to add color to their monster scraper bikes. I emphasized adding patterns to the wheels first and then moving on to the other bike parts. This is AWESOME. I love the drawings and feel so honored to have contributed in some way. Thanks so much for reaching out.